Internationally acclaimed Wellington-based theatre company The Conch specialises in telling Pacific stories through a unique blend of visual magic, spoken word and original music. Through 'Conchus' they harness the power of theatre as a force for social change from Youth programmes in Wellington to setting up of a National Women's theatre in The Solomon Islands . 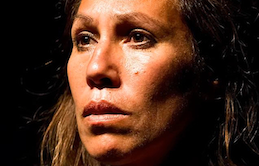 Led by celebrated artistic directors Nina Nawalowalo and Tom McCrory, The Conch has had seasons at the Sydney Opera House and London’s Barbican Theatre. Their latest work, The White Guitar, is soon coming to Hannah Playhouse. The story of the Luafutu family; powerful patriarch John, and sons Matthias and Malo (aka Scribe). The work enjoyed sold out seasons last year in Wellington and in Christchurch, with standing ovations at every show. The White Guitar runs June 28th until July 2nd. Don't miss it! Original generation time 3.8565 seconds. Cache Loaded in: 0.0432 seconds.